It hasn’t even been 48 hours and I’m already struggling with the absence of chocolate in my life. Sad. So let’s talk about things I love other than chocolate. Or rather, I’ll babble on and you’ll read reluctantly. FUN! Ready set go. 1) The Bachelor. I’m not even embarrassed. I can’t get enough. Not a huge fan of Ben, or his middle part. Someone needs to tell him he’s not a Kardashian. Speaking of middle parts, COURTNEY. Her stupid catch phrases and skipping to get a rose and baby talk and fake gun gestures and slutty skinny dipping behavior are INFURIATING but make absolutely fantastic television. But even better than the B-I-T-C-H herself are the spoofs, namely this one and this one. 2) 65 degree days in February. Good weather puts me in such a great mood. I was walking around Federal Hill today and then went to go teach Body Pump and I was practically bouncing off the walls. Usually when I teach there I’m more subdued because I’m pretty sure everyone thinks I’m a loser. They’re all young professionals and I’m just… young. But I was happier than I’ve ever been in my stupid black Under Armour ninja suit. 3) My morning commute. Now that my classes are later and I get to school early just to get work done and find a parking spot, the absurdity of Baltimore traffic isn’t as annoying. I love being by myself in my car for a half hour or so, pretending my voice is just like Adele’s and listening to Jackson Blue’s morning show. I’m this close to being one of those weirdos that calls in to participate in their discussion topics. Oh and I wish I loved that Selena Gomez song just a little bit less. I keep hittin’ re pe-pe-pe-pe-pe-peat. 4) This cookie dough dip. The can of chickpeas was staring at me from the lazy Susan making me crave chocolate. Normal. So I adapted the recipe from the Super Bowl to fit my Lenten obligations. And it hit the spot. Puree the chickpeas in a food processor. 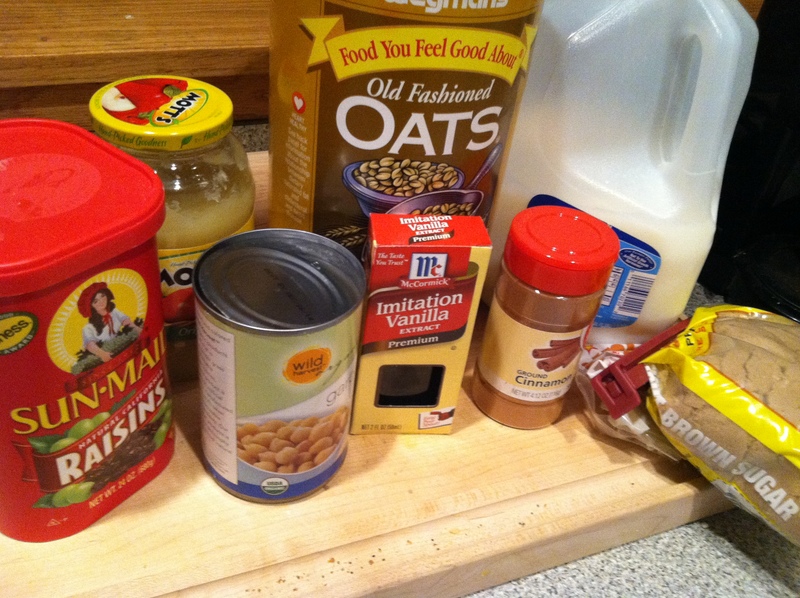 Add brown sugar, vanilla, applesauce, milk, cinnamon, and 1/2 cup oatmeal and blend until combined. 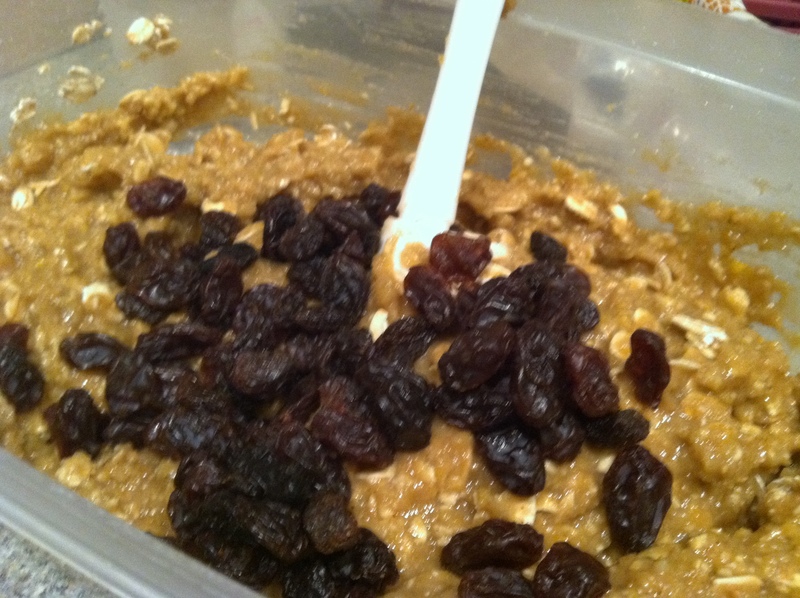 Place in a bowl and stir in the rest of the oatmeal and the raisins. 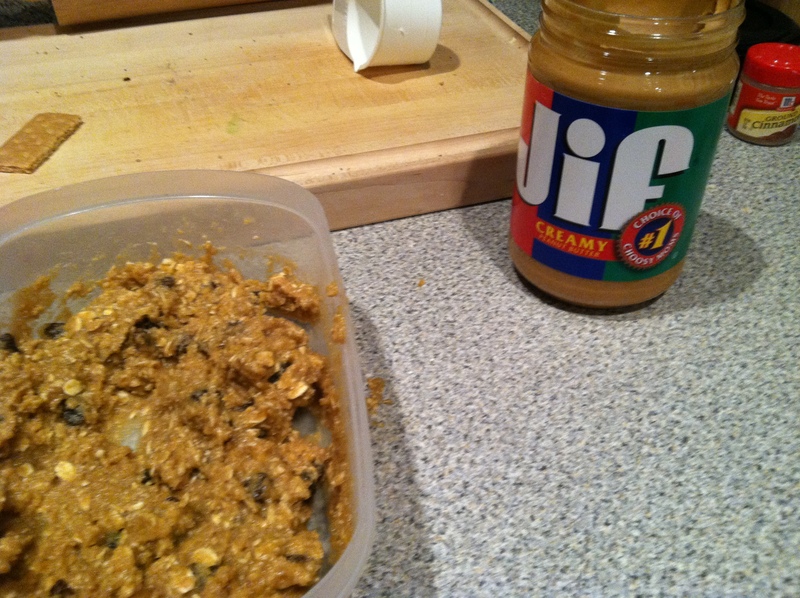 I started eating it at this point, but then made a gametime decision to add peanut butter. Look at it lingering there like a stalker in the corner. I know peanut butter isn’t a traditional oatmeal raisin cookie ingredient, but it has super powers in this recipe. I know, peanut butter always has super powers. 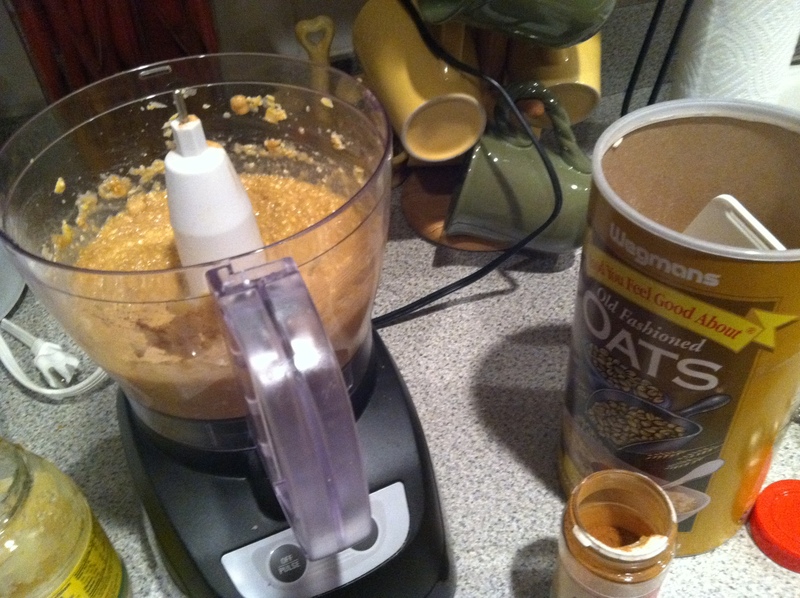 But really, it masked the chickpea flavor and somehow made it taste more like oatmeal raisin dough. Of which I’ve had my fair share. Sorry there are limited, crappy pictures. I was watching The Voice while I made it so I was a little distracted. Which brings me to..
5) Adam Levine. Enough said.